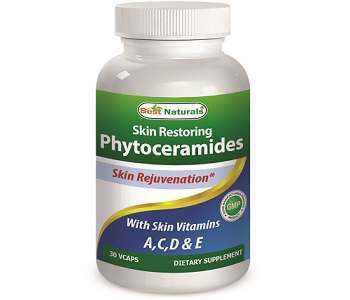 Best Naturals Phytoceramides From Wheat Review - Does It Work? 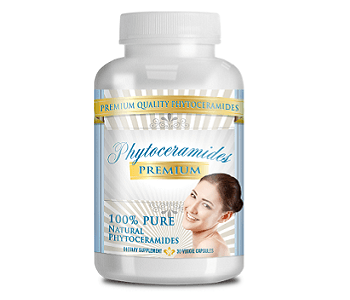 Best Naturals Phytoceramides from Wheat is a supplement which helps maintain healthy skin by keeping the skin hydrated to eliminate the signs of aging. According to the manufacturer, Phytoceramides improve the lipid content of the skin which helps to lock the moisture inside the cells when the body’s natural production of ceramides declines with age. Read on for all the details from our review of this product. To improve the ceramide and lipid content of the skin Best Naturals Phytoceramides from Wheat contains vitamin A, C, D & E. The inactive ingredients include vegetable cellulose, silica, cellulose and vegetable stearate. It contains no artificial colors, artificial sweeteners, preservatives, corn, soy, egg, lactose, gluten, yeast, fish or sodium. Vitamin A, C, D and E are proven to improve the skin’s collagen, which improves the hydration of skin and elasticity of the skin. The recommended dosage of the product is one capsule with food, every day. Since this product is made from wheat, those who have an allergy to it and/or gluten should of course not use it. You could buy the product from the manufacturer’s website at a price of $22.74, at the time we wrote this review. An older version of the product was available on Amazon, but we were unable to find this version. While the company does offer a refund plan, it is not what we would call a guarantee. You can only return unopened product and must do so within 30 days of purchase to qualify for a refund. As noted above, although we were unable to find this version of the product on Amazon, an older version is still sold there and the customer reviews for it are decidedly mixed and not, overall, too impressive. Best Naturals Phytoceramides from Wheat contains vitamins which are good for skin and are proven to increase its softness and elasticity. Phytoceramides help increases the level of ceramides in body which in turn increases the lipid component of cells and their moisture-retaining properties. We appreciate that this product is made from all natural ingredients and is manufactured according to GMP standards in the USA. However, the minimalistic return/refund policy prevents new users from trying the product risk-free and evaluating its efficacy. In addition, the lack of real-world customer feedback for this product combined with the very mixed feedback for a preceding version gives us pause to question its overall effectiveness. And while it’s not the most expensive Phytoceramides product out there, it’s also not particularly inexpensive. We would suggest looking for a product with a “customer-first” return policy, a better track record (or one at all) of customer reviews and, ideally, a better sticker price.